← Marilyn Monroe-inspired Candy Bars (and more) from It’Sugar! 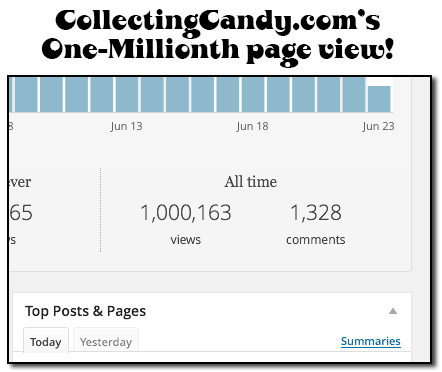 Two nights ago while I slept, CollectingCandy.com’s page view counter ticked over past one million. It’s such a big round number and one I’m excited to see the site hit. 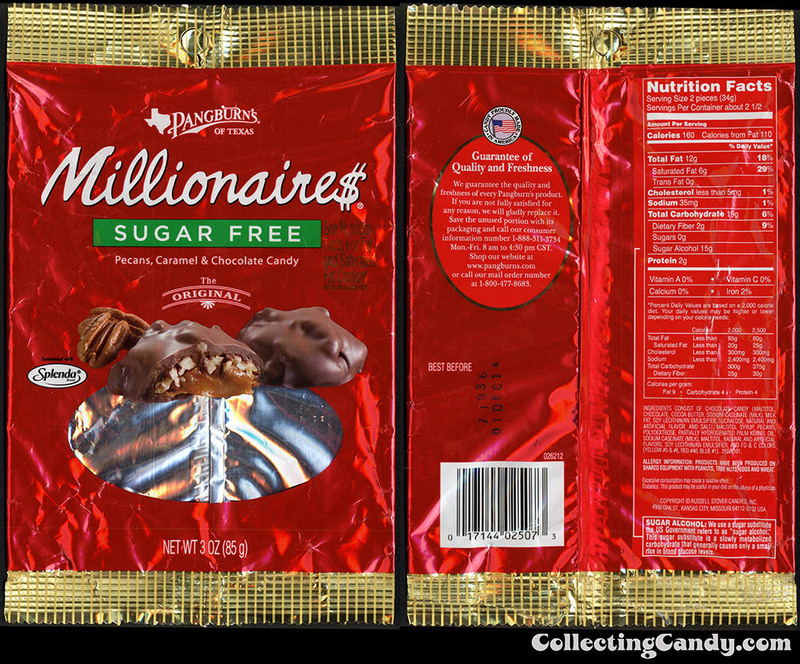 As such, I thought the perfect way to mark the occasion would be to look back at an appropriately-named treat that’s still around today: Pangburn’s Millionaires! 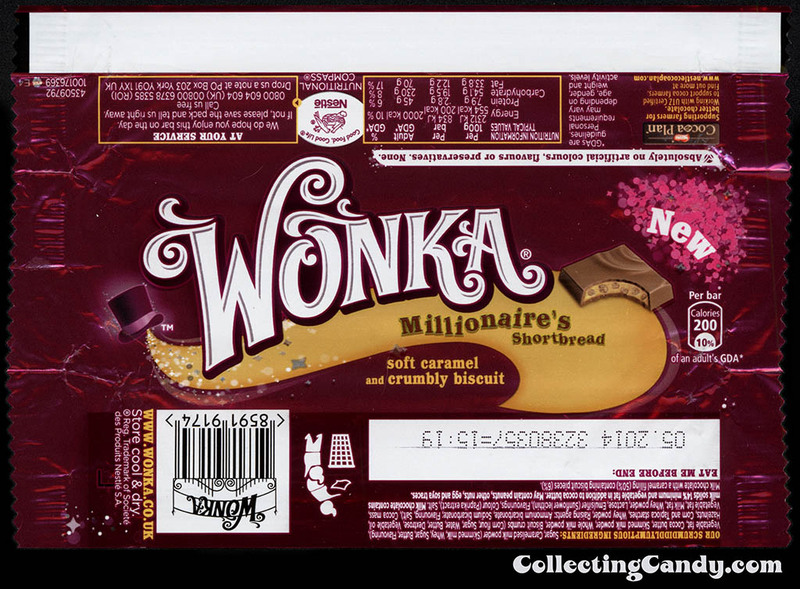 I think that’s a great poster as it features a fun illustration as well as giving us a clear look at the actual Millionaires candy and packaging. 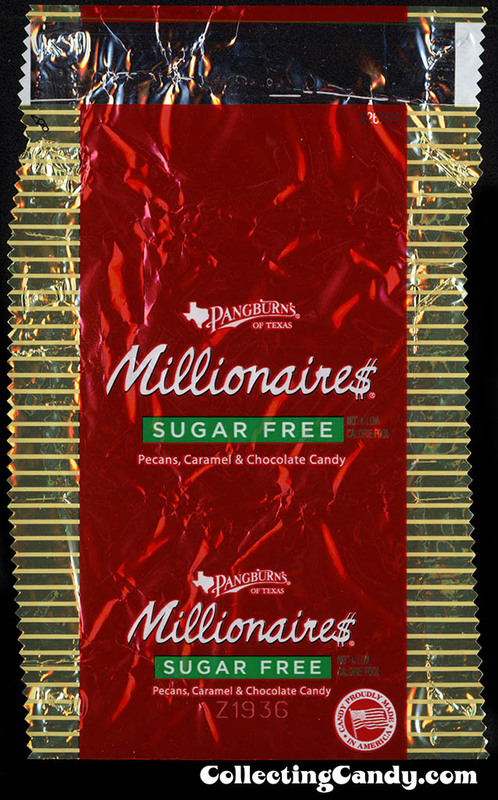 Jumping ahead to last year, I learned that Pangburn’s of Texas still exists as do their classic Millionaires. It’s great to see that Russell Stover has kept Pangburn’s name and products alive, bringing them into the modern era while still acknowledging their rich heritage. That’s everything I have on Pangburn’s Millionaires, but it’s not the only thing I have to share today. 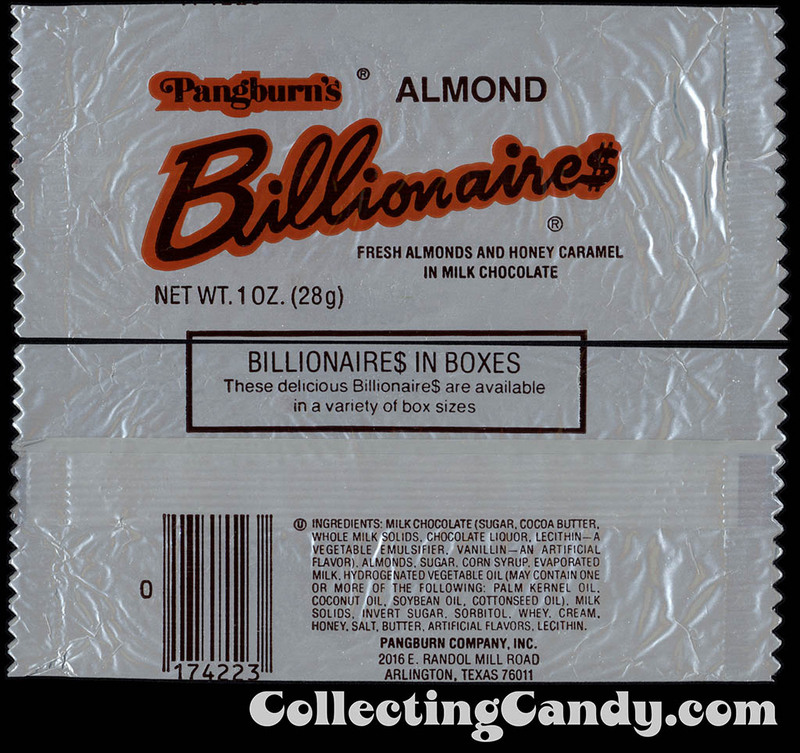 Back in the 1980’s, Pangburn’s Billionaires were an almond variant on the pecans found in Millionaires. 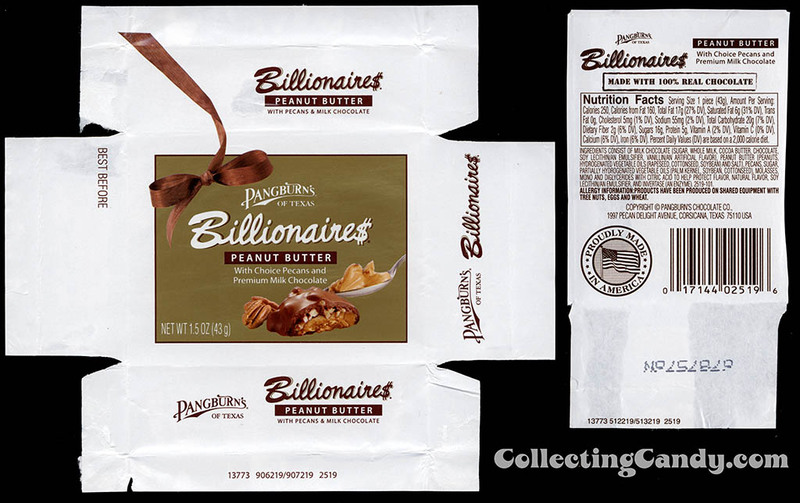 But when I picked up a modern version of Billionaires, it appears that they have taken a different direction with the contemporary recipe. I think either recipe sounds great – and having sampled the modern Billionaires, I’m a fan. 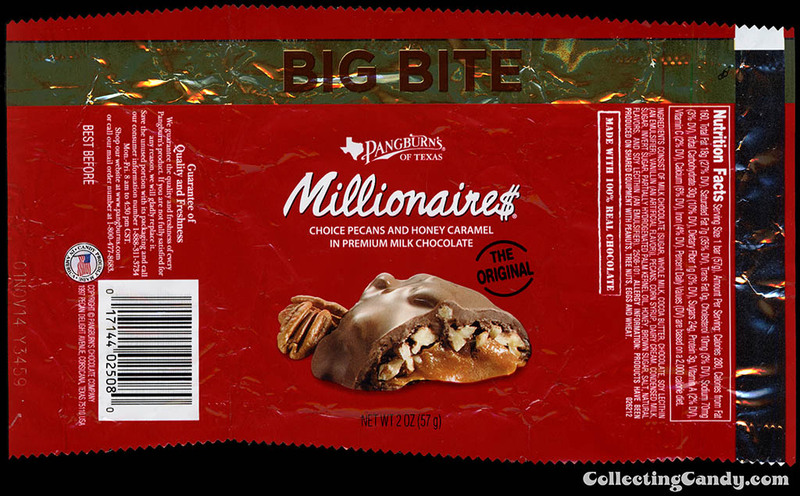 So that’s everything I’ve got from Pangburn’s of Texas and their Millionaires/Billionaires product lineup and history. I hope you’ve enjoyed checking them out. 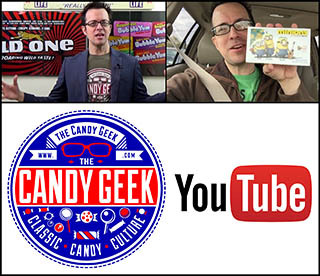 I want to thank everyone for visiting CollectingCandy.com these past two-and-a-half-years and helping us reach this fun milestone. We are only just beginning, so keep visiting and we’ll keep investigating and celebrating the lost histories and mysteries of candy. Hold on! One extra piece to share. This entry was posted in 1950's, 1960's, 1970's, 1980's, Boxed, Chocolate, Nestle, Peanut Butter, Wonka and tagged 1950's, 1960's, 1970's, candy collecting, candy collection, candy collector, candy wrapper collection, candy wrapper collector, collectible, collecting candy, confectionery, confections, Nestle, packaging, Pangburn's, sweets, vintage, vintage candy wrapper, Wonka, wrapper. Bookmark the permalink. 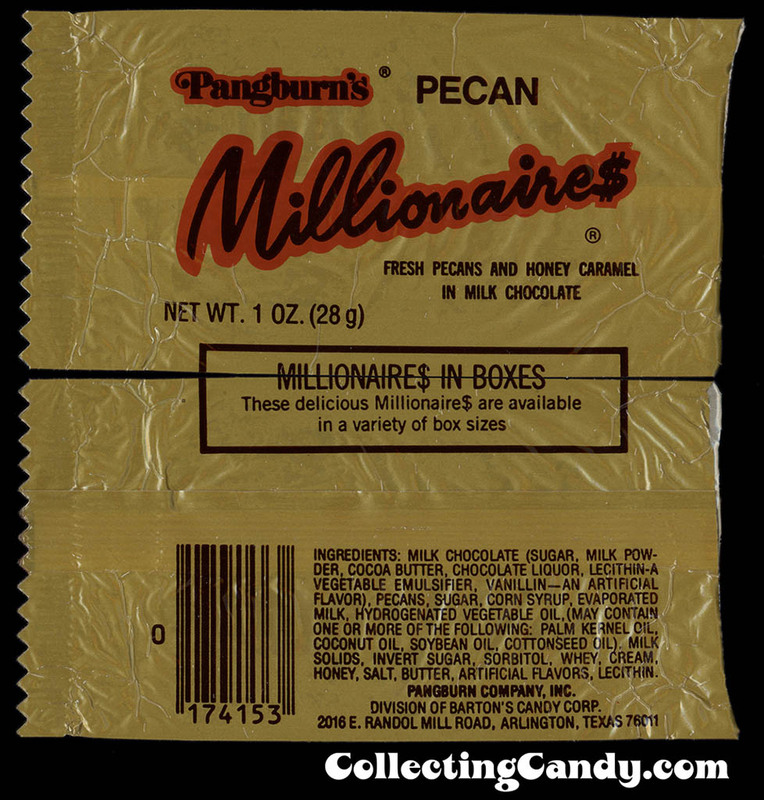 4 Responses to Celebrating our One-Millionth Pageview with Pangburn’s Millionaires! Congrats on the million views! 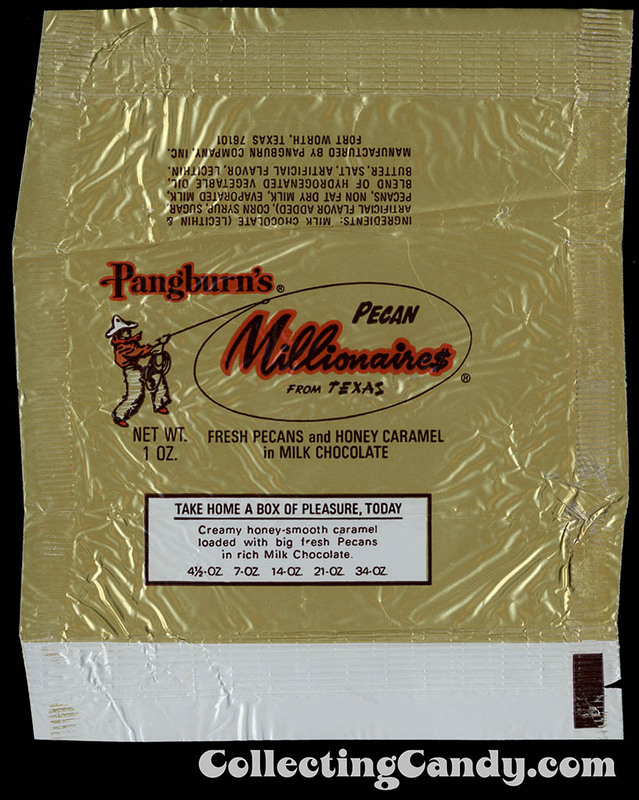 I grew up where Pangburn’s were made, and remember getting those back in the day. I imagine that J.R. Ewing had a few of those, too. Congrats on the milestone of a million! It’s well deserved! !